They say the Gods laugh at men who make plans. 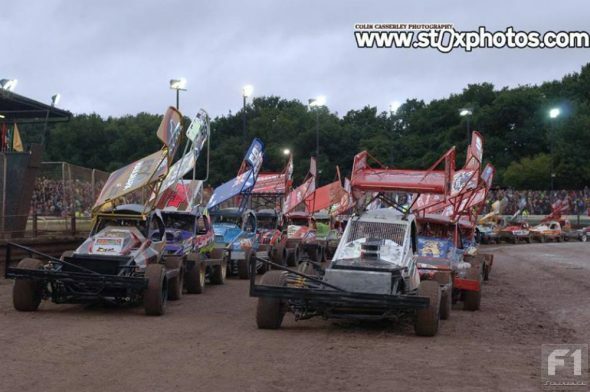 If that is true, the deity in charge of the weather must have been euphoric on Saturday 3rd September as he or she watched the rain pouring down on the thousands of fans gathered at Coventry Stadium for the last ever Formula One Stock car World Final to be held at this iconic arena. Time trials for the overseas qualifiers were cancelled and grid positions for the big race were allocated on timings taken from the excellent “Overseas Only” meeting held the night before, putting Johan Catsburg (H99) and Peter Bengston (NZ58) on row three of the World Final grid. Johan must have managed to put in a quick lap sometime during the evening as his best (and only) place was a seventh in the Grand National while Bengston fared a little better. A very impressive Roy Maessen (H400, in the hired Christian Weyenberg car) lined up on row six inside Martin Verhoef (H8) while comeback kid Ron Kroonder (H217) and Kiwi Phil Ogle (NZ282) made up row nine. Row twelve featured Netherlands young guns Bas Peetoom (H694) and Marten Bijlsma (H422) while the last four spots on the grid were filled by more Dutch aces who really should have featured further near the front – John van’t Veer (H16), Pieter van der Iest (H226), Durk Greidanus (H29) and Koen Maris (H61). Several drivers were seen to be inspecting the decidedly tacky track prior to the start including defending champion Rob Speak (who no doubt had no intention of repeating the outcome of his 2014 bid for gold at Coventry) and Dan Johnson who walked the length of the back straight to check the state of the shale. Once Michael Stokes, Leader of Rugby Borough Council and the man instrumental in brokering the deal with the new owners of the stadium, had given the order to “Start your engines” the excitement level finally went up several gears. After two rolling laps a very orderly start saw pole sitter Nigel Green (445) in the lead, but only as far as the first corner. 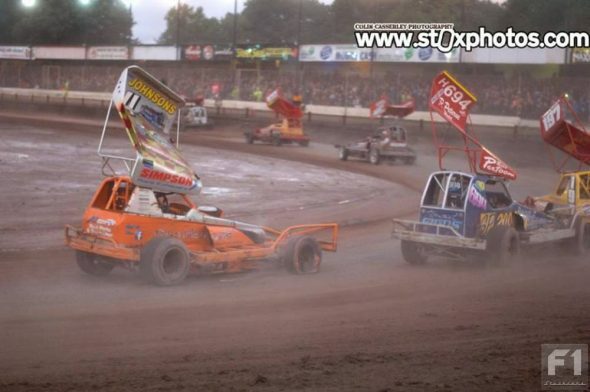 Speaky sent him wide but was himself tapped wide by Mat Newson (16), the Norwich man taking the lead ahead of Frankie Wainman Junior (515) while Catsburg tangled with Bengston. Johnson was third, Speak fourth and a very quick Mick Sworder in fifth. 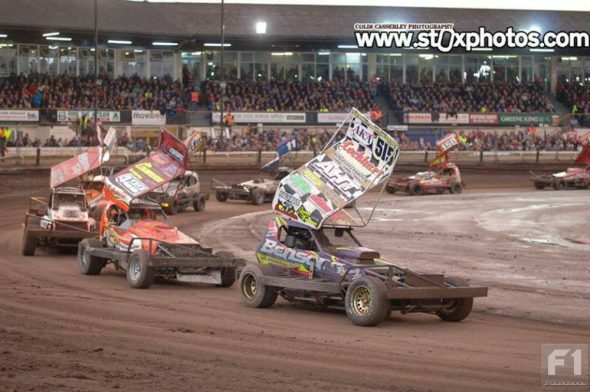 Newson’s race lasted but two laps, hitting the stationary Scriven (11) car on the pit bend, while Wainman nipped across the infield into first place, several car lengths clear, but a caution for Harris (84) and Steward (512), locked together on the back straight, wiped out any advantage. 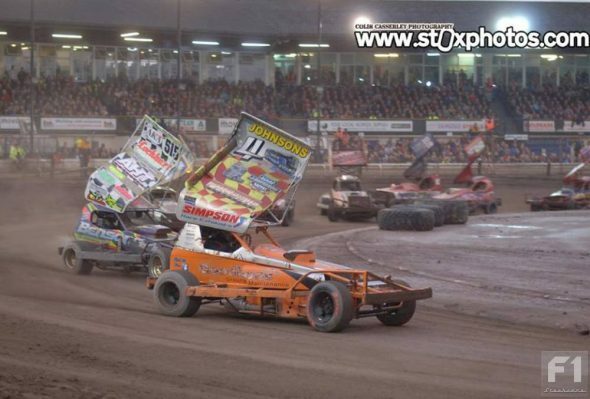 Wainman had Bijlsma and vant’ Veer as a cushion between himself and second-placed Johnson but they both wisely moved aside at the restart letting the 4 and 318 cars fill the 515 mirrors. Sworder passed Speak for third but another caution brought the first four cars nose to tail. Sworder passed Johnson for second on this latest restart and when Wainman clipped the 445 car on the pit bend the Sworder fans cheered. 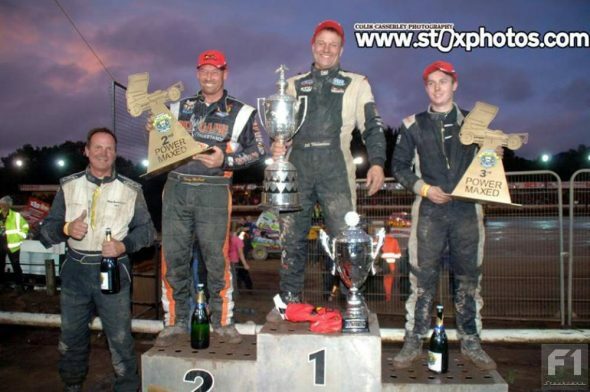 They cheered even louder when the British Champion hit the spun Chris Cowley (37) car head-on on turn four, but Sworder had to take to the infield, losing both momentum and second place to Wainman, then third to Speak as Johnson forged ahead down the home straight in the lead. Johnson extended his lead to several car lengths and looked on course for victory but Wainman was slowly narrowing the gap, driving the now dry bends like tarmac. Entering the pits bend with Wainman close behind Johnson struck the back-marking Peetoom car, popping his outside front tyre and Wainman was back into the lead. Frankie took the five to go board next time around and kept well ahead of the second-placed Speak machine as the laps wound down to record his third World Championship on home soil to a tumultuous reception from the crowd. If the 1998 win was contentious and the 2005 victory controlled and calculated, Frankie’s 2016 title win could well be summed up in one word – confidence. The 2016 shale car, debuted at King’s Lynn in March, has been the one to beat all season. Being top WC qualifier gave Frankie the choice of semis and he opted for Buxton, sending some main rivals on to the unpredictable Sheffield shale and you can’t help but think that that eventual second place at the Peak District track was really just what he was after. That said, the world weekend was probably no picnic for Team Wainman at first .The Ogle car needed lots of work on the Friday night – at one stage the entire rear axle was out but they still got the Kiwi on track for the consolation, only for the engine to wave the white flag. A replacement engine was brought down from Silsden and fitted on Saturday. When the world finalists lined up for the big race, most were probably psyching themselves up for the quest ahead – not Frankie, he was halfway down the grid checking on the NZ282 car. You could be forgiven for thinking Frankie would be resting on his (non-supplied) laurels for the rest of the evening, having taken the premier prize in BriSCA stock car racing – was he eckers like! When I went to congratulate him after the meeting he was in the thick of things as usual. “We need to get the seat out of that one” he shouted to the team, pointing at Frankie JJ’s shale car. A couple of Dutch fans shook his hand but you could tell the new world champion’s mind was focusing on the next day, probably working out the logistics of getting the shale cars, the tarmac cars, Phoebe’s V8 and the NZ282 car to either Northampton or back home to Silsden for repair. Oh, and there was also a gold aerofoil to find by Sunday as well!